Today is the end of part one to our series on the Gospel of Mark. In the spring, we will look at the last 6 chapters leading up to Easter. In Mark 10, we see a series of stories about people's ideas about going to heaven or gaining eternal life. Don't miss the recurring theme here. People think they've got it all figured out, and Jesus confronts their misguided attempts. It starts with parents bringing their little children to be blessed by Jesus, and the disciples thinking this is too much of a distraction. Jesus rebukes His disciples and tells them, "Anyone who does not receive the kingdom of God like a little child will never enter it." And there is the problem for so many people. We don't approach God the way little kids do, with awe, wonder, and a belief that He can do all things. We think we must figure it all out first, and many times give up because we think the Bible is too hard to understand. The next problem Jesus explains comes as a man questions Him about what he must do to inherit eternal life. Again, many think that if they "do" the right things and don't "do" the wrong things, then God will let them into heaven. Jesus plays along for a moment and asks the man about the "doing" things found in the ten commandments. And it says that, "Jesus looked at him and loved him." Jesus then points out the one thing he lacks - dependence on God instead of all he has. Jesus teaches that prosperity is not an indicator of God's love. After the story of two disciples asking Jesus if they can sit at his right or left when He comes into His glory, we see the most unlikely example of one who sees the way to follow Jesus. A blind man calls out for mercy as Jesus is walking by. He doesn't care what anyone else thinks, he knows that Jesus is the Messiah and only He can make a difference in this man's life. How about you? On your mark, get set, go! In the beginning of today's message, we watched a humorous video to get us ready for Thanksgiving. As the sweet little girl prays with a thankful heart for many, many things, her family gets distracted by other things. Right near the end, her prayer turns to them and they stop to focus on what matters. As we get into the text of God's Word today in Mark 9, we see some interesting contrasts. We start with what we call the Transfiguration. Jesus takes three disciples with Him up on a mountain and they experience something truly amazing. Maybe you've had a "mountaintop experience" with Jesus. But we all have to come down off the mountain at some point. And as the disciples do, they find a sharp contrast to what they have just experienced with Jesus. While they have been gone, a crowd has developed around the disciples, including a challenge from some teachers of the law. In the midst, they have totally lost focus on a man who has come for help for his son. The discussion that unfolds puts the attention back where it should have been. My hope is that today's message will help encourage you in how to handle the difficulties you face when coming down off the mountain. 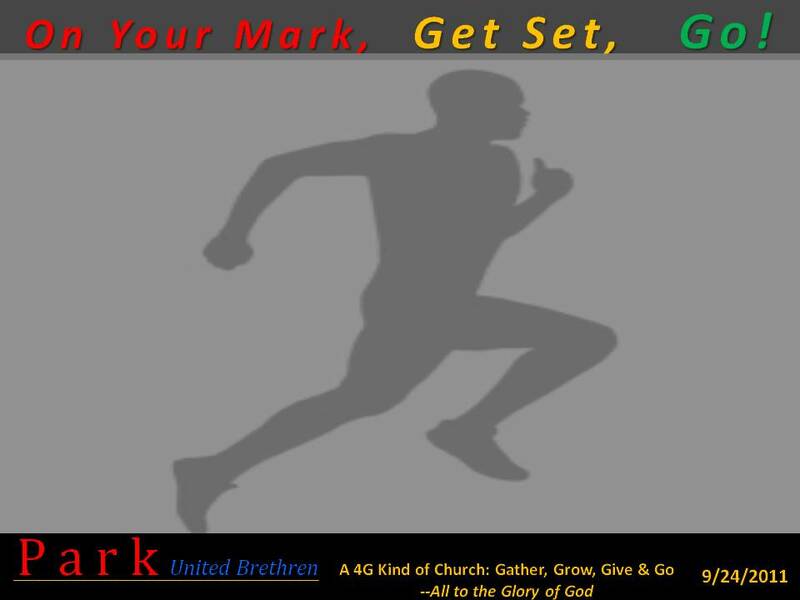 Like our theme in this series, after getting "set" and focused on following Jesus, it's all about what you do with the time between "on your mark" and the time He says "go" that makes a difference. Listen in and be encouraged as we near the end of our series. Were you ever an athlete in school? I tried. My legs were a little shorter than I wanted. Although I ended up playing Golf, I did try to run track. One event – the 400m. But it was a distance for me, not a sprint like everyone else. I’ll always remember the change that happened around turn three, though. Once the end was in sight, I began to run faster. It was the turning point from just running to running with a purpose. Like turn three for me, Mark chapter eight is a turning point in the disciples’ relationship with Jesus. That’s the point of today’s message. We can’t live our lives based on the opinions and philosophies of others. We each must decide who we think Jesus is and respond accordingly. Peter is the one who speaks up and says, “You are the Christ.” How Jesus responds might surprise you at first. It marks the change in His relationship with them that each of us needs to experience. Listen in and be encouraged by God’s great love for you and what we must do in response to His offer of grace. We all have traditions - things that are special to us. Many have been handed down to us from parents and grandparents. We have a certain way we do things and times when they seem important to do them. Traditions are more than just a habit, but can grow out of them. Traditions may be right or wrong. Your way of doing something may be different than mine, but does that make either of us wrong? We run into this in the church with music. 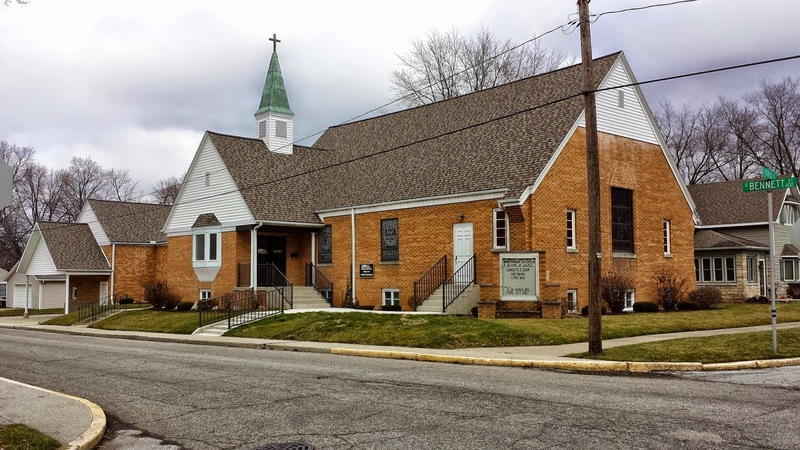 Some prefer the older hymns, others like more contemporary styles with more instruments. Is either wrong? Is there some standard we can measure against? In today's message, we look at Jesus talking about traditions. He is challenged by the religious leaders around him because they say he is wrong for not following certain traditions. Jesus turns the story upside down on them. Their challenge is about what makes a person clean, and they think that the ceremonial washing they do makes a difference in a person's standing with God. Jesus gets to the real issue of what makes a person clean before God, and it isn't about what we do for a show to others. Jesus teaches here that what comes out of our heart is a better indicator of our spiritual condition than what we eat or other actions that try to look holy. What about you? Is your religion based on following actions that have been handed down to you, or is it about worship to Jesus because you have a relationship with Him that is real and personal? That's what makes the difference. Listen in and be encouraged today. Sometimes the all too familiar blends in and we don’t see it anymore. We think we know what’s already there and don’t really notice anymore. The same thing happens with people. We sometimes keep thinking in terms of their past and not who they have become. In today’s message, we look at the contrast between the familiar and unfamiliar. Jesus goes back to his hometown. The people are amazed, yet don’t want to believe in Him because they think they know about his past. After this, we see the story of Jesus sending out the disciples in pairs to share the Good News and call people to repent and turn back to God. When they get back, they are excited to share the news with Jesus, but tired. Jesus then teaches them of His unlimited resources and power with two examples of overcoming the impossible. What about you? Have you ever felt like God gave you some task that seemed impossible for you to do? Our problem usually comes from looking at our limited resources and abilities in trying to solve the task. But God is unlimited. The disciples learned that day and night how to put their faith in action. It’s now our turn. On your Mark, get set, Go! So far in this series we have seen who Jesus is through the actions He does. Sometimes He's healing in crowds, other times one-on-one. . He overcomes anything, to the surprise of His disciples. Whether it is a physical disability, sickness, demon possession, or even nature there is nothing He can’t do. And there’s a progression to the power we see through Jesus. Today, we jump into chapter 5 at the point where a man comes running to Jesus and falls at his feet to beg Him to heal is daughter. And this isn’t just any man, he is the ruler of the local synagogue. Any religions leaders we have seen up to this point have been challenging Jesus and looking for ways to kill Him. This man’s life is going to change regardless of whether Jesus heals his daughter. He doesn’t care what anybody else thinks, but simply comes trusting in Jesus to do something. That’s what faith is, acting on what you believe even if you haven’t seen it happen to you yet. Have you ever come to Jesus that way? As Jesus turns to follow this man, He is interrupted by another who has left it all behind to come to Jesus. I pray that as you listen to this message, your faith will be strengthened and you will have a personal moment coming to Jesus with faith like these. Now on your mark, get set, go! I remember years ago being asked for the first time if I could give a sermon while our pastor was on vacation. If he thought I was ready, I figured I would give it a try. Since I was so nervous about making a mistake, I decided to share as much from the Bible as I knew. I must have used 15-20 verses I had learned about in Sunday School or Youth Group. Back and forth through the Bible we went for about 10 minutes. Much to my surprise, I was asked again the next year. Now what? I've already shared everything I know for sure. In my study time, I came across the story we hear again in today's message. Back then I had picked this because it's one of those rare times when Jesus explains the parable to the disciples. I figured can't get it wrong if I just repeat what Jesus said. Today, we go a little deeper into chapter 4 of Mark than I did those many years ago. The question to ask yourself from this passage is, what does the soil of your heart look like? Confused? Give a listen and find out what Jesus means by the parable of the sower. After the day was done, Jesus got into a boat with the disciples and fell asleep while a storm came in and threatened to sink the boat they were in. If you miss everything else from the message - get this: Your life has a purpose and you were created for something, not to avoid something. God wants us to live not in fear, but in trusting Him. Now on your mark, get set, go! Do you prefer to be in the middle of a large crowd, or by yourself? While I prefer to be alone at times, I am finding myself more comfortable in larger crowds. I was recently at a Newsboys concert and stood in the 16th row. Being that close to the stage and having the keyboard player right over my head during part of the show was amazing. When I get to heaven someday, I want to be in the crowd worshiping Jesus, as close to front as I can get. When we look at chapter 3 of Mark, we see crowds continuing to gather around Jesus, almost crushing him. People are coming for different reasons - some to see miracles, others to be healed, others to hear words of life, and a few who are looking to find fault. The message today starts with Jesus going out on a boat to teach because of the crowd pressing in on Him. Then He goes off on a mountainside to pray and calls those He wants to use for sharing His message of hope. As we look at the people He calls, they are ordinary people, just like you and me. They aren't religious superstars, and as we keep reading we will see they don't understand much of the time, and make mistakes along the way. I don't know about you, but that gives me a lot of encouragement to know that God wants to use someone like me, despite all of my faults and failures. When Jesus comes down with His disciples, He goes into a home and is again surrounded by so many people that He and the disciples can't even eat. Not only have the religious leaders come to challenge Him again, but his own family thinks Jesus has lost His mind and comes to take Him away. Maybe you are a believer and friends or family don't understand why you choose to live your life for Jesus instead of what they are pursuing. Take encouragement from what Jesus teaches about a spiritual family. Now on your mark, get set, go! In today's lesson from Mark 2, we look at two very different men who meet Jesus for the first time. Maybe you've never really met Him either. Let their introductions encourage you. The first guy is paralyzed and is brought to Jesus by four friends. They have heard the miracles Jesus has been performing, and believe He has the power to help their friend. When they find Jesus, he is in the middle of a house full of people, listening as He preaches to them. No mention of miracles yet, just pressing in to hear what He has to say. When they can't get their friend close enough for Jesus to touch him, they climb up on the roof, make a hole in it, and lower their friend in front of Jesus. This is what everyone has been waiting for. Instead of touching the man and healing him, Jesus says something far more important, which gets to the true motives of why everyone is in the room. In this one encounter, we learn about the relationship between faith, healing, and forgiveness. It begs the question for those today that are followers of Jesus: Who are you carrying to Him? The other guy we look at today is very different. He doesn't have a physical ailment, in fact he probably has everything he wants. He was a tax collector, a known thief. Jesus challenges him that day to leave it all behind and follow Him. It was probably difficult for the other guys traveling around with Jesus to accept that this guy who had likely been cheating them for years could be forgiven and one of them now. Again, it's a challenge for us sometimes today to accept that God can forgive people who have done wrong to us and society. What will you do with the truth of God's forgiveness? It's your turn. Now, on your mark, get set, go! I've loved having an Android phone for the last year. The most useful feature to me is the built in GPS application. GPS works very well as long as you know where you want to go. Like the rest of life, wandering around with no destination just doesn't get you very far. And life is about the journey, not just the destination. Make sure you are on the right journey and you get to experience the full joy of both. One of the Growth Groups we offering periodically at Park is called Experiencing God. The Christian life is not about a one moment decision, but experiencing Jesus on a daily basis, and living an intentional life here until we spend forever with Him in heaven. As we get into the story of Jesus in the last half of Mark 1 this week, we see how Jesus lived an intentional life. He teaches us principles to live by today. We see the difference between getting distracted by a good thing instead of a great thing comes down to time spent in prayer. We also see how import showing compassion to others really is. I hope you'll go on the journey with us. Now on your mark, get set, go! Last year at this time we began doing things differently as a church. We had an event last fall called "The Unveiling" where we explored the idea of God becoming available to everyone when the curtain (veil) in the Temple was torn in two from top to bottom. As a reminder, we gave everyone a piece of cloth and together tore them in two to remember what God had done for us. We've been know to give out other gifts as well, even money. On this Sunday, we gave everyone at Park a copy of the Gospel of Mark from the new 2010 NIV translation. Bibles make great gifts, just not for me - I have plenty! In fact, I don't use paper bibles that much anymore, I'm a digital kind of guy. If you're like me, three great resources to check out are: Bible Explorer, E-Sword, and YouVersion. I use each in a different way. You should try them out. The reason we gave out the Gospel of Mark is because we are about to launch into a ten week study of the life of Jesus as recorded in Mark. The title for the series is "On Your Mark, Get Set, Go!" We will also be studying the same opening 10 chapters of Mark together in Growth Groups throughout the week. Mark is great for studying because it is action packed with what Jesus did during the 3 1/2 years of his public ministry. 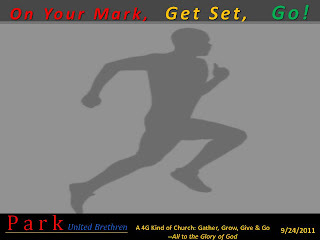 On Your Mark: John the Baptist prepared the way for Jesus, teaching a baptism of repentance for the forgiveness of sins. Go: Jesus begins sharing the gospel message and calling people to leave their old life and follow him. We hope to see you along for the adventure. Now on your mark, get set, Go! Your life can change in a moment. We all learned that 10 years ago, when the unthinkable happened to our nation. So much has changed since those moments when hijacked planes struck the world trade center, Pentagon, and crashed in a field before reaching the fourth target. In many ways, it's like the abrupt changes that happened in the life of Joseph. Today, we finish the story of this man who went from favored son, to slave, and then to prisoner. After being forgotten, he in a moment was exulted to the second in command of a nation. Throughout the ups and downs of his life, Joseph remained committed to honoring God and as we see again today, gives God praise even for the difficult periods in his life. As Joseph continues to show care for his brothers, he can now see the bigger picture of what God has been doing through his life. The question throughout the series hasn't been whether you can make sense of everything going on in your life at the moment, but are you looking forward to better days ahead? I've you have been to Park UB during this series, you've seen the grey towers on each side of the platform getting filled in with what look like random colored shapes throughout the series. They started out in the first week as simply grey, but I said there was a message there you couldn't see. Each week we have filled in more of the picture surrounding the message on each. Last week, someone came up to me and said "I can see it now." This week, just about everyone could. The messages that have been hidden there all along (left in the grey space) are "HOPE" and "LOVE" and it's no accident. In today's story, Joseph's game with his brothers comes to an end. He's been testing them to see if they have really changed in the last 20+ years. Judah is the one we read has changed the most. If you remember, he was the one that came up with the idea to sell Joseph in the first place. Through this story, we find that in the midst of tough situations, even the ones we can't understand, God is working through us to give us hope and experience His love. It's in these moments we are encouraged to look forward to better days ahead. Have you ever had a hard time finding something, only to later realize it was right in front of you all the time? The first time someone showed me a 3D Stereogram, I hated it. You know, those pictures that look like repeating patters or just random dots on a page, that somehow have a 3D image hidden in them? Once I learned the trick (crossing your eyes and then focusing through the page as your eyes uncross) I was amazed at what had been there all the time. My mind tried to tell me it wasn’t, but now I could see. The same thing happens in life – seeming chaos all around us but the picture is right in front of us. The issue is perspective, learning to see from a different vantage point. In our last series at Park, we introduced the song “Give Me Your Eyes” to think about looking at life from God’s perspective. This week we start a new series on the life of Joseph from the Old Testament. In his life, things start off great and begin to go much, much worse. As the story unfolds, you may find yourself in one of the characters. The good news is that even though you may not be able to see Him yet, God is there in the center of it all and wants to lead you to better days ahead. When it comes to love, we can find a lot of ways to get it wrong. 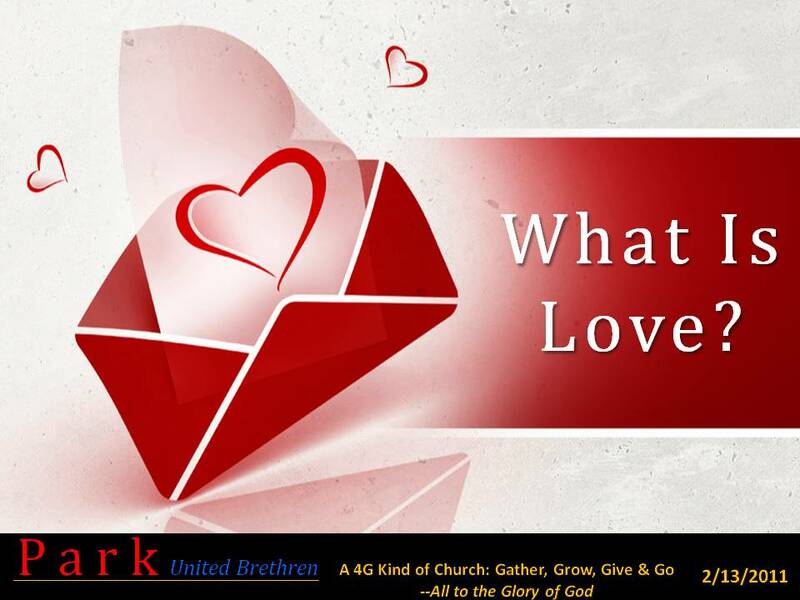 These first three weeks in this series at Park, we are looking at how we get love wrong sometimes and how to get it right. Next Sunday we wrap up the series on ways Jesus got it right. Jesus taught that it wasn't by what we say, but by how we love one another that people will really know we are followers of Him. So, how is your love an attitude in action? Today, we look at the end of Hebrews to learn about love. We are admonished to love one another like brothers, and different ways that might look like. We are encouraged to entertain strangers, never knowing when one might be an angel. Brotherly love also means remembering those who are mistreated and the sanctity of marriage. Finally, we look at brotherly love and how that is a part of living content with what God has blessed us with. Near the end of the message we looked at a video from Jars of Clay encouraging us in how to show our love. To close, we looked at the words Jesus spoke about the difference between those who said they knew God, and those who showed it by their love to those around them. Show yours today. Love is something you know when you experience it - something we should all be sharing. Just like a picture is worth a thousand words, most people pick the picture instead of the words. Love is an attitude in action, not just an emotion. And that love becomes a battlefield when we forget what true love is, and begin to want what looks like it would be best for us instead of the best for the other person. Paul in the Bible spoke of this in 1 Corinthians 13, comparing what love should and should not look like. Today we look at how those play out today. Love is an attitude in action, and it has to be shown. In this first week, we build the foundation the rest of the series will build from. In John 13:35, Jesus tells his disciples, "By this all men will know that you are my disciples, if you love one another." Not the things we say, but how we live. And when it comes to God's love, we can't buy it, but we sure can give it away. At the end of the message, we gave away a little incentive to help people do just that. May you be inspired to do the same today. Many people live life thinking there will always be more time to make a change in their life or to make a difference in their world. We miss the urgency to make the change right now. This week we open up with a parody by the Right Now organization called "Maybe Later." Click here to watch that video. Today, we look at the end of the teaching Jesus did on that day we have been studying from Luke 12. Jesus says that He did not come to bring peace, but division. Jesus brings conflict - you must make a decision as to whether you believe in him or not, you can't just ignore him. You must make a choice. And remember, life is temporary, so what do you choose today? Msg: Life Is Temporary: Are YOU Ready? Certain things we remember. Whether it's scent, a touch, or a photo, there some things that evoke a memory from our past that comes rushing to our mind that can be either from a painful or joyful moment in our lives.Many of those moments come from the unexpected things in life, while others are from something we longed for which finally came. Some things we are commanded to remember and the reason for it is to be ready and prepared for what will come our way. Last week we heard that Jesus said "Where your treasure is, there your heart will be also." How we spend our time, where we store our treasure, and how we use our talent are all indicators of what we truly believe. You can't live one way and say Oh I love Jesus and be believed if the two don't line up. As we continue from where we left off last week in Luke 12, Jesus tells stories about being ready. Some people live life thinking "maybe someday I'll get right with God" but the Bible tells us to be ready now, because we don't know when Jesus is coming back. It could be too late. And remember, life is temporary, so are YOU ready? Msg: Life Is Temporary: Where is your treasure? The world we live in today can give us a lot of things to worry about. The question is, are you looking for something to fall back on when times are tough, or Someone to lift you up? Worry is something we were never meant to live with. The truth we read from God's Word is that He cares for even the lowly, despised, and weak things in the world - and you mean so much more to Him! As we look again at the life of Jesus from Luke 12, we see Jesus explaining the relationship between worry and faith. Worrying gets you nowhere in life. Worrying is not something a Christian should do, because it shows a lack of faith. Our Father in heaven wants to bless us and knows our needs. Begin today to live life differently, trusting in a God who loves you, cares for you, and wants you to believe He will supply your needs. And remember, life is temporary, so what are you living for? Msg: Life Is Temporary: What are you living for? Do you like being around people who worry a lot or who are always anxious? Me neither. What if it's you? The source for a lot of worries in life comes from our pursuit of stuff. What's going to happen to my stuff? In today's message we go back to the story in Luke 12 we started two weeks ago. Jesus is talking to his disciples and someone in the crowd of thousands that has gathered shouts out for Jesus to tell his brother to share with him. Jesus replied by telling the crowd a parable about a farmer who was blessed with more than he could use and chose to tear down his barns to build bigger ones to store it all instead of sharing with others in need. Jesus then turns back to his disciples and shares the story we look at today. Near the end of the message, I shared a video from 12 Stone Church in Lawrenceville, Georgia. Click here to watch that video. After listening and watching, ask yourself, "Where is my treasure?" Remember - life here is temporary, so what are you living for? Today we had special guests at Park: Pastor Randy Fennig and his wife Toni . If you listened to or saw last week's message, the Fennigs have been living as "Traders" for years. They are temporarily back in the US on furlough and will be returning to Sierra Leone in West Africa soon. You can learn more about the work they are doing in Sierra Leone as part of Global Ministries by clicking here. We were blessed to have them come and for Randy to share an encouraging and challenging message from God's Word. As you continue making the change to live life as a trader, what will you do with the little bit that you have? Remember - life here is temporary, so what are you living for? Msg: Life Is Temporary: Will You be a Trader? We started off the new year with a question: What are you really living for? The world gives us lots of ideas about the meaning of life and what we should pursue with our time, energy, and resources. But is that the best there is? What does the Bible give as a suggestion here? What does the God who created us and loves us think? What should our perspective on life be as we consider the days we have left to make a difference here? During the message you will hear from a powerful video clip from the RightNow Campaign. You can view the video on their website by clicking here. So the question we ask you is this: Will this be the year you become a trader?